The St. Joseph Edition of the NABRE is here! When I saw this on Amazon (out of stock) I went ahead and ordered two different ones from two independent bookstores. Much to my dismay, both copies I received were the old NAB! So I returned both and hopped on the horn to the Catholic Book Publishing Corporation. A week or so later my St. Joseph NABRE Full-Size Deluxe Gift Edition arrived. As if anyone may not know, the CBPC is probably the most well-known publisher of Catholic books including Bibles, Missals, and the Liturgy of the Hours. I believe the “Gift Editions” of their Bibles have the most complementary presentation of the NAB text available. And, as with many of the books from CBPC intended for frequent use, it has a sewn binding and ribbon bookmark. 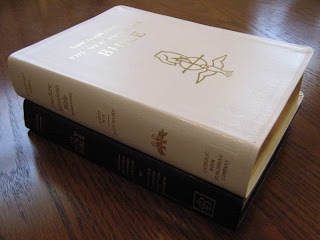 Of course, it seems that there are always pros and cons to every edition of the Bible, but I will start with the good. 1. The paper and font. The text is bold and dark, and it is printed on bright white paper with very little bleed-through. This, of course, makes it slightly thicker than many other Bibles (by comparison it is the same thickness as the St. Benedict Press black NABRE.) The Biblical text is in a very traditional looking font, and per usual CBPC style, the outlined headings and paragraph headings are in different more modern looking fonts. I think the different fonts are a plus for seeing the added outlined divisions and I am glad that has remained a CBPC tradition. 2. The spacing and page layout. Again, very high marks here. The text is very comfortably spaced between chapters, paragraphs, and all the margins. The layout, including notes and cross references, is so evenly spaced throughout, one might think the CBPC version is the “official” version of the NAB. 3. Extra Features. There are quite a few bells and whistles in this edition of the NABRE. There are over 100 photographs and maps of the Holy Land, which are distributed throughout the text. These pictures range from maps and charts specific to the text, to photographs of archeological finds, to an artist's scale model of Solomon’s Temple (for example.) Also, there are sections of full color glossy pictures inserted throughout. Most are pictures of Biblical scenes; they are colorful but realistic paintings, among the same found in Fr. Lovasik’s “New Catholic Picture Bible”, also from CBPC. Also included in the color sections are photographs of the Holy Land, the Rosary, Stations of the Cross, and a “Family Record” section. Finally, there is an index of Sunday readings and a Bible Dictionary in the back. 4. Improvements over the old St. Joseph Edition. CBPC has finally, finally, conformed to the Chapter, colon, verse reference system used by virtually every other contemporary publisher that I know of (e.g. Ps 34:4.) 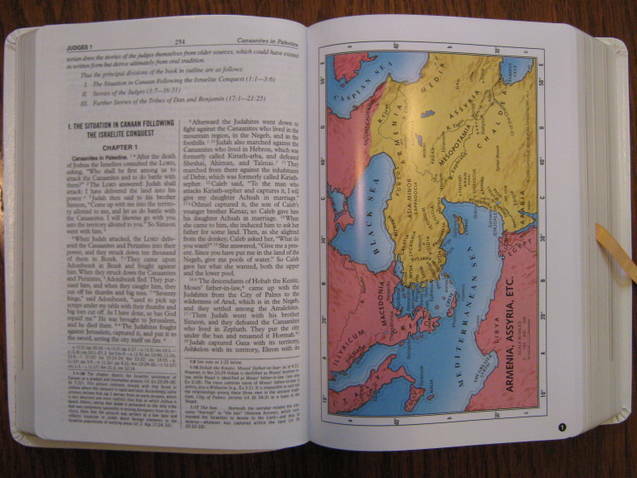 Also, this edition has sections of full color maps, rather than just the black and white ones throughout the text. It is strange, however, that the OT color map section is at the beginning of Judges rather that at the back with the NT ones like most Bibles. Nine maps in all. The last improvement I have noticed is an easier to read historical chronology at the front of the Bible. Now for the bad: I really do not have a lot of criticism here so I am putting it in one paragraph. I have heard some people criticize the color paintings, but be aware that these are not the comic book drawings that are in the CBPC Sunday Missal. My major complaint is that you can only get all the bells and whistles in the Full Size Edition. I prefer a medium-sized Bible, but the medium-sized edition has an abbreviated version of the Bible dictionary and about half of the pictures. Also, in the Medium Sized Edition the full-color sections have a tendency to stick up in the air (although the Full Size Edition does not.) There are also Student editions available, but be aware that they of lesser paper and print quality and have far fewer extras. The “Deluxe” version that I have was listed as being “Genuine Leather” in its old NAB format, but now the website lists it as “bonded”, and it still says “white leather” on the box, so who knows? CBPC has only made the transition to NABRE standard for most of their editions in the past week, and the website was only updated within the last week as well. All of the Medium-sized Gift Editions appear to still only be available in Bonded or Imitation leather. I have the St. Joseph Edition of the New American Bible Revised Edition, large type, illustrated (30 maps, 70 black and white photographs), black flexible imitation leather, with a bible dictionary, doctrinal bible index, and a list of Sunday readings. I like it very much except that it's not really easy to hold it in hand or lap for reading. It's best laid out on a desk or table. I just picked this Bible up last week at my local Catholic book store. It has about the most readable print (11 point) and as reported, with very little bleed through (about the best around)! The bonded leather lays flat in your hand or on a table. I like it also, I wasn't even in the market for another NABRE Bible, but somehow it found its way into my car? Has CBPC updated the photos and pictures in this edition? It always felt "dated" when I looked at one, like it was printed in the 1950's. If the photos and pictures remain unchanged, I'll probably pass on this edition. The copy I have has crisper details in the pictures than the previous editions I have seen... which was the NAB Revised Psalms and NT. I have also found the color map section in the OT helpful because it gives you the bigger picture to compare against when looking at the smaller maps in the text. Little improvements in small details like these can make a big difference in regards to study and devotional use! Dang! I was hoping they'd completely change the art. Two-thousand years of Catholic art and this is the best we can do? I'll probably pass on this one too for now. I agree. If its the same old artwork/illustrations, I'll have to pass. Too many other good choices out there than to go with a 1950's looking bible.